It started as most of our favorite things do, by accident, much the same way that we somehow stumbled into wedding photography 13 years ago. When we realized we needed a break from the hustle of Southern California our overstretched lives had necessitated, we moved onward and upward to a cabin in the woods in the tiny mountain town of Idyllwild, California. While only 100 miles from our old home and life on the coast, it was a literal world away from everything we had known. Little did we know just how desperately we needed the two years we would spend retreated away on the mountain. Luckily for us, even though we were a world away from our previous life, we were still close enough for some of our dearest friends from near and far to come visit and stay with us in our mountain abode. Then one day, an accidental series of portraits was born. When our first visitors and very dearest friends The Chan's (pictured above) came to visit, the morning they were due to leave I decided to make a portrait of them on the picnic table in the back yard. It happened quickly and with no fuss and somewhere between those few clicks and the time I was developing the film I made a commitment to photograph everyone else who made the effort to come visit us from there on out. The rules were simple: The portraits had to be on the picnic table in the backyard, they had to be photographed from the same direction, they had to be un-coerced, and they had to be on black and white film. This collection is a favorite single image from each session. The Chans - The Inception of the Visitor Portraits - Photographed on a Hasselblad 500CM with a 80mm f2.8 lens on TRI-X film. It started as most of our favorite things do, by accident...much in the same way that we somehow stumbled into wedding photography 13 years ago. When we realized we needed a break from the Southern Californian hustle our overstretched lives had necessitated, we moved onward and upward to a cabin in the woods in the tiny mountain town of Idyllwild, California. While only 100 miles from our old home and life on the coast, it was a literal world away from everything we had known. Little did we know just how desperately we needed the two years we would spend retreated away on the mountain. Luckily for us, even though we were a world away from our previous life, we were still close enough for some of our dearest friends from near and far to come visit and stay with us in our mountain abode. Then one day, a series of portraits was born. When our first visitors and very dearest friends The Chan's (pictured above) came to visit, I decided to make a portrait of them on the picnic table in the back yard right before they were about to leave. It happened quickly and with no fuss, and somewhere between those few clicks and the time I was developing the film, I made a commitment to photograph everyone else who made the effort to come visit us from there on out. Each session served as a brief intersection of points on two families journeys. At the time, we didn't know we would move on from that special place in the woods eastward to Nashville. Little did many of the people in these images know that they would soon move, add new children, end relationships, or change careers. Despite life carrying on as life tends to do, these images serve as a lasting testament to very special people, on a very un-special table, in a very special place. 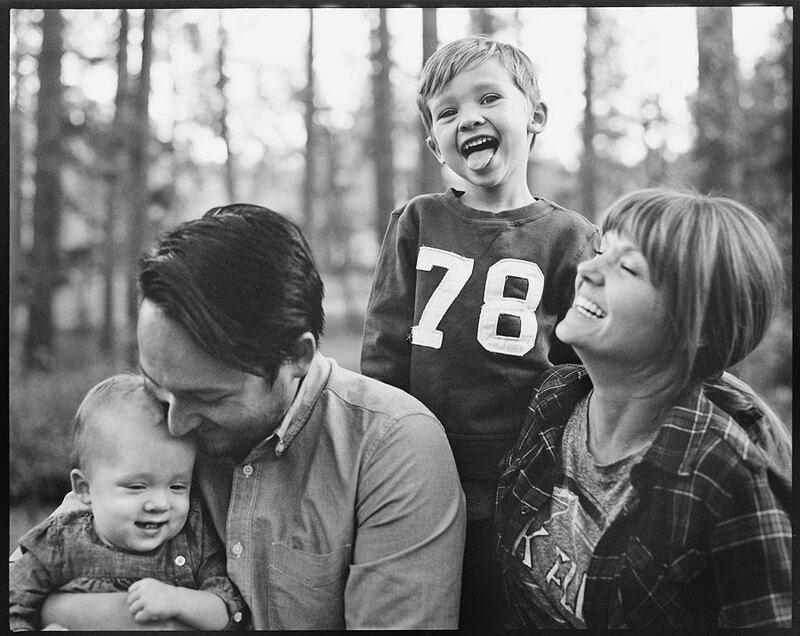 The Carlsons - Photographed on a Hasselblad 500CM with 80mm f2.8 and TRI-X film. The Snelsons - Photographed on a Hasselblad X-Pan with 45mm f4 lens on TRI-X film. The Bovees - Photographed on a Hasselblad 500CM with 60mm f3.5 lens on TRI-X film. The Becklunds - Photographed on a Polaroid 180 on Fuji FP3000bw film. The Fortes - Photographed on a Olympus OM2 with 135mm f3.5 on TRI-X film. Grace and Chuck - Photographed on a Hasselblad 500CM with 60mm f3.5 on TRI-X film. The Ellsworths - Photographed on a Hasselblad 500CM with 60mm f3.5 on TRI-X film. The Christensons - Photographed on an Olympus Pen FT with 38mm f2.8 on TRI-X film. The Shermans - Photographed on a Hasselblad 500CM with 60mm f3.5 on TRI-X film. The Cannons - Photographed on a Zone VI 4x5 field camera with 210mm f5.6 APO Schneider lens on TRI-X film. Yvette and Kurt, all the way from Australia - Photographed on an Olympus OM2 with 50mm f1.4 on TRI-X film. They are The Parsons - Photographed on a Minolta Autocord on TRI-X film. The Uys - Photographed on a Hasselblad 500CM with 60mm f3.5 on TRI-X film. Bentley with Grace and Jasper - Photographed on a Minolta Autocord on TRI-X film. Quite fittingly, our last Visitor Portrait was of the family that inadvertently started it all, The Chans - Photographed on a Pentax 67 with 90mm f2.8 on TRI-X film.